It’s no secret that dual-cab utes have long gone beyond being mere tools-of-trade. A significant proportion of private buyers in the segment are opting for highly-specified versions with equipment lists to rival a premium passenger car. The onus on comfort is telling. It tells us that the (still mostly male) buyers of these sorts of passenger utilities are regularly using them for lifestyle purposes, ferrying the kids or carrying the dirt bike rather than covering them in building site residue. For a few years now, the best ‘lifestyle’ ute has been the Volkswagen Amarok, which started the trend of earning five ANCAP stars (now de rigeur) and bringing to the table a car-like nature not yet bettered. If you want something to throw at heavy labour, you might be drawn to something like a cheaper Isuzu D-Max, or trust the top-selling Toyota HiLux and Ford Ranger (soon to be replaced by new or updated versions), or Mitsubishi Triton (just replaced by a new model). Much of that comes down to perception and heresay. But one thing is less arguable — for weekend warriors, the Argentinian-made Amarok (differentiated thereby from its unanimously Thai-made rivals) takes the cake. Or does it? 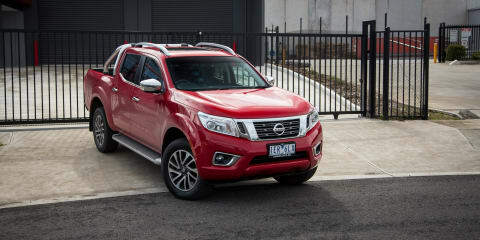 Because the latest iteration of a famous nameplate — ‘Nissan Navara’ — has come ‘a knocking, bashing down the door with something new to the segment for mainstream utes — car-like multi-link rear suspension. In addition, Nissan has ditched the old D40’s rugged square lines — ironically somewhat similar to the Amarok — for its brand-signature curves, and brought the cabin design and safety rating into the second decade of the 21st century. The Volkswagen Amarok Highline TDI420 and Nissan Navara ST-X fit the bill as alternatives as if it were written just for them. But which of these two comfort-focused and weekend-warrior-ready options does the job better? The Nissan is off to a strong start here. Whichever way you cut it, the Navara wins convincingly in the area of price and features. The top-of-line Navara ST-X retails for $51,990 plus on-road costs, though with the seven-speed automatic transmission as tested here, that climbs to $54,490. The Amarok TDI420 Highline, unlike the ST-X, is not the flagship variant (that title belongs instead to the Ultimate). Nevertheless it’s pricier, at $55,490 with its standard eight-speed auto shifter. Both are less than the incoming Ranger XLT ($56,590), while other high-spec utes such as the Isuzu D-Max LS-U ($48,300) and Mitsubishi Triton Exceed ($47,490) undercut them. The outgoing HiLux SR5 auto costs $54,490. Both come with standard equipment including a reverse-view camera and sensors (front/rear on the VW, rear only on the Navara), steering wheel controls, Bluetooth phone and audio streaming, cruise control, multiple 12V outlets in the cabin and one in the tray, satellite navigation and climate control air conditioning. Anachronistically, the Volkswagen misses out on a USB point as standard kit, making do with an auxiliary input only, but a USB ‘media-in’ adapter cable can be added as a $88.88 option. They also both get blingy sports bars and side steps, automatic headlights, daytime running lights, and chrome highlights on various body parts to make each stand out from the ‘pleb’ utes. Unique to the Navara though, are black leather seats (a $2390 option on the VW) with heating up front ($590 on the VW) and electric adjustment for the driver, push-button start, Bi-Xenon headlights (can be bundled into a Lights and Vision pack on the VW for $2390), and — novelly — a power sunroof and electric sliding window in the rear glass overlooking the tray. The cloth-seated, sunroof-less and ignition barrel-toting Volkswagen also has a smaller touchscreen than the Nissan (5.0-inch versus 7.0-inch). However, it does have unique features such as rain-sensing wipers, a digital speedo integrated into its trip computer and all-round auto up/down windows. On the safety front, both of these cars score the now requisite five-star ANCAP rating (the Navara against tougher 2015 ratings, not the 2011 ones like the VW), but only the Nissan gets a driver’s knee bag and — most egregiously — curtain airbags for the rear occupants. The VW makes do with front head protection and front side airbags only. On the flip side, the Navara, unlike the Amarok, does not offer ISOFIX anchors for child seats in the rear. Neither get stuff like the new Ranger XLT will as an option, such as Adaptive Cruise Control with Forward Collision Alert, Lane Departure Warning and Lane Keep Assist. The Navara has the edge in terms of standard features, and it also looks more impressive inside, on first impression at least, by way of the glossy black and silver inserts, and the plush leather padding on contact points. The Amarok’s dash layout is austere and subdued by comparison, and there are not too many visible signs that you’re driving around in a highly-specced load-lugger. Both offer decent, though not outstanding, cabin storage with notably small gloveboxes and consoles, nice open cubbies atop the dash, sunglasses holders, heaps of cupholders (10 in the Navara) and big door pockets — lined in felt in the VW, which look nice but will be a magnet for crumbs, dirt and dog hairs if you have a canine companion. Both cabins feel generally well screwed together, and the plastics feel hard-wearing and are simple to clean in both. Both also have simple to navigate touchscreens, though the Navara’s larger unit is naturally easier to see. Both offer Bluetooth that re-paired quickly and offered crisp enough audio quality, though the VW’s sat-nav had a tendency to bark out instructions over the top of your call. The biggest weakness of the Navara is its steering wheel, which lacks reach adjustment on the column unlike the Amarok, and which has a teardrop design that makes it all too easy to accidentally tap the horn. The Amarok looks low-key and lacks features, but there are no dubious ergonomic bugbears, which are the things you tend to notice all the time. Some people find the front seats a little lacking in support, so if you go for a test yourself, it’s worth making sure you like them. I had no issues. In the rear, the Navara edges the Amarok for knee room and is the only one with rear air vents. That sliding rear window is also great — your four-legged mate riding in the back will love it. The Volkswagen counters with better headroom and toe room, a wider and lower rear bench (meaning you can fit three adults back there without grumbling) and superior outward visibility on account of its box-like design and square windows. It also has three adjustable headrests unlike the Navara’s two. The Volkswagen is more than 100mm wider than the Nissan, and it feels it on the inside. The Navara may have the blingier and better-equipped cabin, but it’s the Amarok with the bigger tray. The VW’s cargo area is 1620mm across at its widest point (1222mm between the arches – wide enough for a standard Aussie pallet at 1165mm) and 1555mm long, while the sides are 508mm high. the Navara’s tray is 1560mm wide (1130mm between the arches – too narrow for an Aussie pallet), 1503mm long and 474mm high. Interestingly, though, the pair have tailgate openings of almost identical size — 1364mm for the VW, 1360mm for the Navara). The Nissan, however, comes standard in Navara ST-X guise with a hard-wearing protective tub liner that you have to add as a $418 accessory on the Amarok. And while the Volkswagen has four tie-down hoops, the Navara has a clever ‘Utili-Track’ rail system with moveable tie-down points that offers more versatility. In terms of payload, the Amarok is standard guise wins, with a payload of exactly 1000 kilograms (one-tonne) with the standard five-leaf rear setup, versus 930kg for the Navara with its novel, car-like multi-link rear suspension (more on that later). We would note the Volkswagen offers a no-cost ‘comfort’ package that removes two leaves but lowers the GVM to 2820kg, ergo the payload to 801kg. Our car had the standard heavier duty setup. The new kid on the block, the Navara, loses the old model’s flagship 170kW/550Nm 3.0 V6 turbo-diesel engine in favour of a new, smaller and more efficient 2.3-litre twin-turbo unit — the smaller blower gets you moving, the bigger helps out at speed. Outputs are 140kW at 3750rpm and 450Nm between 1500 and 2500rpm. For context, this is short of the 147kW/470Nm 3.2-litre five-pot in the Ranger and BT-50, but ahead of the new HiLux’s 130kW/450Nm 2.8 diesel and the Triton’s 133kW/430Nm 2.4-litre unit. The version here featured the optional automatic, a seven-speed unit with a manual mode. The Amarok has the smallest engine in the class in terms of capacity — a 2.0-litre unit with two turbochargers like the Navara. In TDI420 guise as tested here, you get 132kW at 4000rpm and 420Nm at 1750rpm. Standard fit is a ZF eight-speed automatic transmission (it’s not a DSG, by the way). The six-speed manual gearbox comes fitted to the TDI400 engine, which produces a lower 400Nm. Despite the Navara’s power/torque drop, the new engine has a higher 3500kg braked towing capacity that the D40. This figure matches the class-leaders. By comparison, the Amarok has a 3000kg rating, though you do get a trailer-sway inhibiting system built into the ESC with the VW genuine towbar kit. Nissan also claims superior fuel economy, with a factory rating of 7.0L/100km compared to 8.3L/100km for the VW. Good luck getting that, given both test cars hovered in the low 10s for our testing. Both have 80-litre tanks. Despite its smaller engine capacity, the Volkswagen feels more urgent off the line thanks to a more responsive throttle, a gearbox that kicks down faster and its 4MOTION permanent four-wheel-drive system in contrast to the Navara’s part-time system with 4H mode (and 4L, making the Nissan the only ute here with a proper low-range setup enabled via a rotary dial) that gives you instant grip compared to the Navara’s chirpy rear without load that can set off the stability control. The Amarok’s 10.4 second 0-100km/h dash eclipsed the Navara’s 10.7sec effort, but the Navara’s greater torque output and wider spread meant it was stronger between 60km/h and 100km/h, taking 6.3sec to complete this test against 6.5sec for the VW. In daily duties, particularly without excessive load, the VW’s drivetrain is the winner. It’s half-a-decibel quieter in the cabin, the auto is that little bit more intuitive (it’s class-leading) and the eighth overdrive ratio allows for effortless cruising. With 650kg in the cargo area and a few blokes in the front, we were nudging the carrying capacity, and the Navara’s extra reservoir of torque gave it a slight edge in terms of low-down delivery, though its gearbox is not as eager to step down. Truth is, neither of these small-capacity oilers would be our first choice if were regularly towing a twin horse float or something similar, but both perform in general duties well. 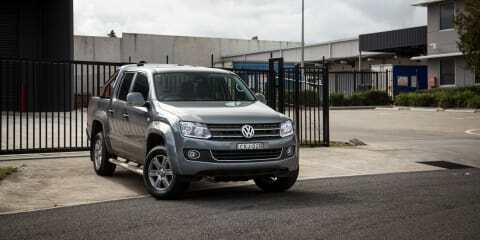 As we said atop the review, the Amarok reigns as the most nimble, composed and car-like ute out there. Both the Volkswagen and Nissan have double wishbone suspension at the front. It’s the Volkswagen that has the ‘sharper’ nose, given it turns-in with greater alacrity while simultaneously soaking up bumps and ruts more effectively than the thumpier Nissan. At the rear, the Amarok has the par-for-the-course rigid axle with five ‘leaves’ and a stabiliser bar, while the Nissan has an unusual multi-link setup with shock absorber. Despite the VW’s more agricultural underpinnings, the way it settles at the rear unladen is comparable to the Nissan, while mid-corner, it feels significantly more planted and less prone to body-roll. The Nissan’s composed rear is undone by the comparatively rough and un-polished front end that lets go (prompting understeer) at times where the VW simply tucks in. Yeah, we get that utes aren’t sportscars, but the German car’s handling on a twisty road is noteworthy due to its comparative excellence anyway. The Volkswagen also performed better under emergency braking (unladen for our test) than the Nissan. Both have rear drums. In a 100km/h to zero brake test, the lighter (no low-range) VW pulled up a few metres shorter. Not only does the VW handle the bends better, it steers better too. Both have rack-and-pinion power steering (not of the electro-assist variety like the new Ranger), but the way they behave is substantially different. The Volkswagen’s steering is light for a ute, yet communicative, and in essence feels very much like the tiller of a passenger car. You can potter around and feel like you’re driving a big Golf. The Navara’s is very heavy, and also slow (3.75 turn lock-to-lock — a full turn more than the VW’s 2.8). This means that not only are inputs more demanding but you have to make bigger ones to turn you as much as you want to turn. It feels, again, like a truck fighting a car. In terms of general bump insulation, both are excellent in the way they iron out potholes and corrugations. Both glide over things like that better than lots of passenger cars we can think of, impressive especially in the Nissan given its lower profile tyres (255/60 Toyos on 18-inch rims compared to 245/65 Bridgestones on 17s in the VW). The Volkswagen has a 4MOTION permanent four-wheel-drive system, whereas the Nissan has a transfer case that engages a low-range (4L) system. Having eight forward ratios means the Amarok can have a low first gear (4.714 ratio) for crawling around. The benefit is that you save weight, while the always-on 4MOTION system as tested here gives four-wheel grip at all times. Of course, Nissan would counter by saying it’s no comparison to a proper crawling low-range mode. This all reinforces the Amarok 4MOTION’s focus as a lifestyle ute rather than a super heavy-duty labourer. Both the Volkswagen and the Nissan have rear diff locks, and off-road assistance tech such as hill descent control built into the ABS that modulates your speed on sharp descents independently of braking. The Navara aces it on ground clearance, with 228mm compared to 192mm. The Nissan’s approach (32.4 degrees), departure (26.7) and breakover (23.8) angles compare to the Amarok’s 28.0-degree approach and 23.6-degree departure angles. The Navara’s 450mm wading depth, though, is 50mm less than the VW’s. Laden, the Volkswagen’s setup seemed to deal with things in a more conventional way, and the effectiveness in that rear stabiliser bar is such that when lugging 650kg, the rear feels scarcely different. This is because it never really feels unsettled to begin with. As our pictures attest, the Navara’s bum drops significantly more with a load, though the company insists this is by design because the multi-link setup inherently has greater travel. With weight on-board, the change in overall ride quality compared to unladen was more notable than in the VW, which had more consistent behaviour. The Navara sits on rebound dampers, and once you have 410kg in the back, the compression hits two conical rubber bits that control part of the operation. They aren’t bump stops in the conventional sense. Nevertheless, the difference in appearance with an identical load between the Nissan and Volkswagen is quite marked. Nissan offers capped-price servicing for the first six services, at intervals of 20,000km. At current rates (valid util September 30), the first visit costs $522, the second $569, the third $684, the fourth $569, the fifth $522 and the sixth $730. After 120,000km you’ll have paid $3596. The Volkswagen comes with six years of capped-price servicing — intervals are 12-months or 15,000km — that at current rates (valid to December 31) will cost $484 on the first two visits, $583 on the third, $608 on the fourth, $484 on the fifth and $583 on the sixth. You also pay $44 every two years for a new pollen filter and $138 every two years for brake fluid. After 90,000km or six years you’ll have paid $3590. The Navara comes with a three-year/100km warranty, while the Amarok gets three years and unlimited km cover. In terms of price and specification, the newer Navara casts shade at the Amarok. The Volkswagen frankly looks overpriced and under-equipped by comparison. It also has a more relaxed engine with a bigger towing capacity, a proper 4WD system with low-range, and key tray features such as a tub liner, that clever track-based moveable tie-down system and the cool rear window. In other key areas — ride and handling with or without load, transmission response and rear seat space (though the lack of rear airbags is poor) — it’s the Volkswagen that prevails. In isolation, the Nissan feels better than when next to a rival as composed as the Vee-Dub. As I mentioned earlier, neither of these utes would be my first choice if I towed a horse float every day, or if I was contracted on a mine site — rivals such as the D-Max with its relaxed truck engine do that for less — but the nicest ute to live with for the weekend warrior remains the German-by-way-of-Argentina, the Volkswagen Amarok, even if the value equation isn’t as strong. We admit it’s a predictable result. Maybe once the more car-like Ford Ranger arrives with its enviable list of equipment and greatly updated cabin we can re-visit this. Or better still, we test a whole array of new and updated utes en masse. Click on the Photos tab for more Nissan Navara and Volkswagen Amarok images by Tom Fraser.